Just because they have no idea what is going on doesn't mean the babies on your Christmas list don't deserve something adorable under the tree. Might I recommend Wonderland Baby? 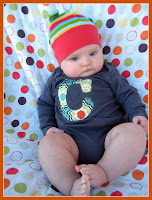 This site is mecca for those of us who love to personalize our babies clothing. The designer - Karilyn - takes your ideas and creates the most precious onesies. Check out some of her custom work to see for yourself. You can even add "bum ruffles"! Collin isn't really into ruffles, but he looks great in everything else Onesie Wonderland offers! Two winners will each receive one custom onesie! Go to Wonderland Baby and check out some of the designs. Come back here and leave a comment mentioning some of your favorites. I will announce the winner on November 17th. Good Luck! I would LOVE a long sleeved onesie with the circle monogram for my baby boy! And the green with the tree. So cute! I voted on Divine Caroline! I love these little onesies! I love the circle monogram. I love the fall tree, i love the pumpkin and I love the reverse applique monogram! But they are ALL adorable! Thanks for sharing! I love the owl, painted monogram with fabric frame, reverse applique monogram, little birdie... They are all great! I voted for you, and got mom to do it, and Dave, and his brother. The owl is my favorite... retro owls are so precious! And Collin models it so well, how handsome! All the little ties are adorable too. I like the little ruffles. I agree with Abby, I'd like the ruffles on our baby girl. I love the hot air balloon onesie. The big brother/little brother onesies are also so cute. They would be great for me in the sister variety! 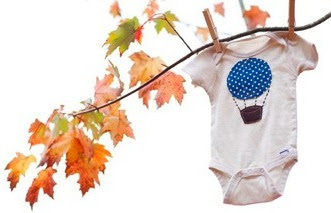 I love the circle monogram and fall tree onesies! Cute stuff! I also voted for you!! I love the fall tree and owl onesies. The letter onesies are pretty cool too. I voted for yo on the Divine Caroline awards. Wish you could vote more than once though! i really like the brother shirts and the fall tree!sweet! I love the fall tree and the the initial with the frame! These are so cute! I love the owl onsie! So cute!! I love the tie onesies and the elephant! She does a great job! I love the monogram onesies, and the elephant is SO cute! Too cute! Great giveaway! My favorite is the custom monogrammed applique one! I follow your blog! and love it by the way! I love the elephant or the monogram, so cute! I love the fall tree one! And of course I follow your blog. I love the pumpkin and the tie! That is cool that she does so much for boys b/c not many sites do. I love the tie onesie - what little one wouldn't look oh so cute in that? Would love a monogram for my lil' girl! I love the tie onesie in blue. My favorites are the elephant and the cute custom ties. I'm running out of clothes for Thomas. I need this. I like the Circle Monogram onesie and the V-neck brother shirts. But...the painted elephant is really cute too!! I love the elephant onsie. It would look cute on my little guy! I love the Little Birdie and the Owl onesie. So cute! I love the Reverse Applique Monogram...this would be perfect for our boy #3 coming in March! I love the elephant onesie. It is soooo cute! The pink long sleve with the air balloon is super cute too! Oh I absolutely love the little birdie onesie. Precious! LOVE the little birdie.. and anything with a monogram is fantastic in my book! The pumpkin, elephant and little birdie are all adorable. So fun! I want the painted elephant longsleve onsie ... so cute! annnnd I grabbed your button! circle monogram is without a doubt my personal favorite - bold and simple, love it! i'm a follower of your sentiments - here's hoping i win! I love the initial onesies. Too cute! I LOVE the owl onesie! 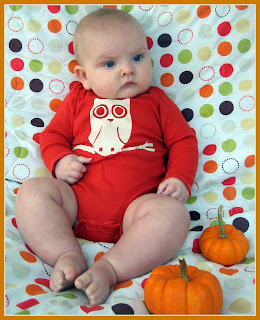 I love the Fall Tree, Owl, and reverse applique monogram onesies. They are all too cute! love the hot air balloon, painted elephant, and fall tree...just to name a few....thanks!! I love the initial onesies, also the cute air balloon.